American air-launched anti-ballistic missile. 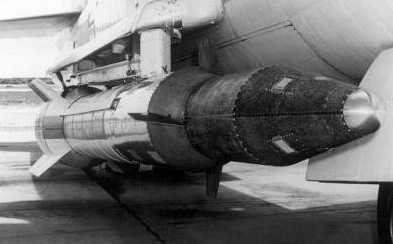 Dropped from B-47 medium bombers, the missile consisted of a Sergeant booster and Altair upper stage. AKA: WS-199. Status: Retired 1959. First Launch: 1958-05-26. Last Launch: 1959-10-13. Number: 12 . Height: 11.30 m (37.00 ft). Diameter: 0.79 m (2.59 ft). Apogee: 200 km (120 mi). Martin received a feasibility contract from the USAF in 1958 for the WS-199B Bold Orion Air-Launched Ballistic Missile. Initial Bold Orions were single-stage missiles boosted by Thiokol TX-20 (XM20) Sergeant solid-propellant motors. Initial flight tests were disappointing. The missile was modified to a two-stage vehicle with an Altair motor, and then achieved a range of 1770 km (1100 miles). The technical results of Bold Orion were useful in development of the Skybolt. The final WS-199B launch tested the Bold Orion as an air-launched anti-satellite missile. After launch at 11,000 m (35,000 ft) the missile guided itself toward the Explorer 6 satellite at an altitude of 251 km (156 miles), passing within 6.4 km (4 miles) of the target. In the late 1950s, the U.S. Air Force studied and tested various strategic weapon options under the WS-199 (Weapon System 199) label. The WS-199A designation applied to Strategic Air Command system studies in general, while three other subprojects flight tested actual hardware. In 1958, Martin received a U.S. Air Force contract to determine the feasibility of an ALBM (Air-Launched Ballistic Missile). Test articles were to be built and flown under project WS-199B Bold Orion. Between 26 May 1958 and 13 October 1959, 12 Bold Orion test launches were conducted using a B-47 Stratojet as carrier aircraft. The missiles used major components from other programs to save time. The first WS-199B missiles were single-stage vehicles powered by a Thiokol TX-20 (XM20) Sergeant solid-fueled rocket, but the initial flight tests were reportedly not very successful. The Bold Orion was then modified to a two-stage missile by adding an Altair second stage. In this configuration, it became a viable ALBM with a range of 1770 km (1100 miles). The results of the Bold Orion program were put into the requirements for the USAF's WS-138A operational ALBM program (leading to the GAM-87-AGM-48 Skybolt). The final WS-199B launch tested the Bold Orion ALBM as an anti-satellite missile. The missile was launched at an altitude of 10700 m (35000 ft) and guided towards the perigee of the satellite Explorer VI at an altitude of 251 km (156 miles). To record its flight path, the Bold Orion transmitted telemetry to the ground, ejected flares to aid visual tracking, and was continuously tracked by radar. The missile successfully passed within 6.4 km (4 miles) of the satellite. In early 1958, Convair and Lockheed jointly proposed the USAF a program to develop an ALBM (Air-Launched Ballistic Missile) for the B-58 Hustler bomber. In June that year, the Air Force awarded a contract for a proof-of-concept test program under project WS-199C High Virgo. Lockheed was responsible for the design and construction of the missile, while Convair built a dedicated launch pylon for installation on the test aircraft (the B-58 prototype). To save development time and cost, Lockheed used proven components from the XQ-5 Kingfisher, X-17, UGM-27 Polaris and MGM-29 Sergeant missiles. The High Virgo missile was powered by a single Thiokol TX-20 Sergeant solid-fueled rocket motor. It was equipped with an Autonetics inertial guidance system, but a development delay caused the first two of four tests to be flown with a preprogrammed autopilot instead. The missile had four tailfins for aerodynamic conrtrol, and was fitted with a plastic nose cone to cover the reentry vehicle. The launch procedure was to fly supersonic at high altitude and drop the High Virgo missile, whose motor would then ignite after a few seconds of free fall to clear the B-58. On the first project 199C flight on 5 September 1958, the missile's control system failed only a few seconds after motor ignition, and the test had to be aborted. The second test on 19 December 1958 was successful, and the missile reached an altitude of 76200 m (250000 ft), a speed of Mach 6, and flew a distance of about 300 km (185 miles). The third flight on 4 June 1959 was the first to use the inertial system, and was also successful. The fourth and final test flight of WS-199C took place on 22 September 1959, and was of a completely different nature. It was to prove the feasibility of an air-launched satellite interceptor missile. For this purpose, the High Virgo missile's nose was slightly lengthened to include 13 photographic cameras. It was planned to fly the missile closely past the Explorer IV satellite, and photograph the satellite to prove the encounter. Because Explorer IV's orbital parameters were found to be inaccurate, the target was changed to Explorer V. To get maximum performance, the missile (nicknamed "King Lofus IV") was dropped at a speed of Mach 2, but 30 seconds after launch later all communication was lost. Because the recoverable camera package wasn't found either, it couldn't be determined whether the satellite intercept was successful. The USAF didn't pursue the Convair-Lockheed B-58 ALBM project further, but had instead begun the WS-138A program for an ALBM launched by the B-52. This program eventually led to the GAM-87-AGM-48 Skybolt missile. The Alpha Draco boost-glide research vehicle was developed and built by McDonnell between 1957 and 1959 under project WS-199D. It was a two stage rocket, powered by Thiokol TX-20 Sergeant and TX-30 solid-fueled rocket motors. The nose cone carried an unpowered glide reentry vehicle. WS-199D was to explore the feasibility of a boost-glide strategic missile, combining a multi-stage rocket booster with an aerodynamic payload vehicle. On a typical flight, Alpha Draco's first stage boosted the vehicle to 12800 m (42000 ft). That stage was then dropped and the vehicle coasted upwards for a while, after which the second stage was ignited to lift the payload to an altitude of 28000 m (92000 ft). The reentry vehicle, having reached Mach 5+, glided towards a preprogrammed location about 390 km (240 miles) from the launch point where it entered a terminal dive into the ocean. Alpha Draco was flown three times during 1959. The program verified basic principles of boost-glide vehicles, and explored hypersonic aero- and thermodynamics. Weight ? 5450 kg (12000 lb) ? Family: aircraft-launched, anti-ballistic. Country: USA. Launch Sites: Cape Canaveral AMR DZ. Agency: Martin. Bibliography: 2, 563. 1958 May 26 - . Launch Site: Cape Canaveral. Launch Platform: B-47. Launch Vehicle: Bold Orion. Test mission - . Nation: USA. Agency: USAF. Apogee: 8.00 km (4.90 mi). 1958 June 27 - . Launch Site: Cape Canaveral. Launch Platform: B-47. Launch Vehicle: Bold Orion. FAILURE: Failure. Test mission - . Nation: USA. Agency: USAF. Apogee: 12 km (7 mi). 1958 July 18 - . Launch Site: Cape Canaveral. Launch Platform: B-47. Launch Vehicle: Bold Orion. Test mission - . Nation: USA. Agency: USAF. Apogee: 100 km (60 mi). 1958 September 25 - . Launch Site: Cape Canaveral. Launch Platform: B-47. Launch Vehicle: Bold Orion. 1958 October 10 - . Launch Site: Cape Canaveral. Launch Platform: B-47. Launch Vehicle: Bold Orion. 1958 November 17 - . Launch Site: Cape Canaveral. Launch Platform: B-47. Launch Vehicle: Bold Orion. 1958 December 8 - . Launch Site: Cape Canaveral. Launch Platform: B-47. Launch Vehicle: Bold Orion. Test mission - . Nation: USA. Agency: USAF. Apogee: 200 km (120 mi). 1958 December 16 - . Launch Site: Cape Canaveral. Launch Platform: B-47. Launch Vehicle: Bold Orion. 1959 April 4 - . Launch Site: Cape Canaveral. Launch Complex: Cape Canaveral AMR DZ. Launch Pad: 29.0 N x 79.0 W. Launch Platform: B-47. Launch Vehicle: Bold Orion. Interceptor mission - . Nation: USA. Agency: USAF. Apogee: 200 km (120 mi). 1959 June 8 - . Launch Site: Cape Canaveral. Launch Complex: Cape Canaveral AMR DZ. Launch Pad: 29.0 N x 79.0 W. Launch Platform: B-47. Launch Vehicle: Bold Orion. Interceptor mission - . Nation: USA. Agency: USAF. Apogee: 100 km (60 mi). 1959 June 19 - . Launch Site: Cape Canaveral. Launch Platform: B-47. Launch Vehicle: Bold Orion. 1959 October 13 - . Launch Site: Cape Canaveral. Launch Complex: Cape Canaveral AMR DZ. Launch Pad: 29.0 N x 79.0 W. Launch Platform: B-47. Launch Vehicle: Bold Orion.